Over the city of Jerusalem, and prayed ‘If Only You Had Recognized The Things That Make For Peace.’ Luke 19.28. 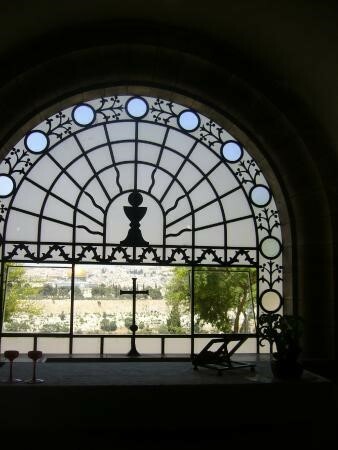 There is now a chapel called Jesus Wept, Dominus Flevit, on the Mount of Olives. Behind the altar is a clear window with a view across the valley to present day Jerusalem. In this window there is a silhouette of the Eucharistic chalice for bread and wine, above the outline of the cross. The Pater Noster Church is nearby, which brings to mind Jesus prayer for ‘Our Father’s Will To Be Done On Earth.’ Jesus’ love for Jerusalem and the world that he saw was embodied in what he chose to do, and which led the people he loved to crucify him. and ascended to his Father and our Father. His followers saw the WOUNDS in JESUS’ RISEN BODY. These wounds are an eternal sign of the passionate loving prayer of a sufferer for all who suffer on earth. He Always Lives To Make Intercession For Us; Hebrews 7.25 and his presence in bread and wine represents the procession of the HOLY SPIRIT, THE STRENGTHENER. ‘The Spirit Helps Us In Our Weakness For We Do Not Know How To Pray As We Ought.’ Romans 8.26.
we pray for the coming of your kingdom. In 1956 during the Suez crisis, I was aware that my developing faith in Christ crucified showed an alternative way. I discovered the Fellowship of Reconciliation basis for the enthronement of love in personal, commercial and national life. I became a conscientious objector to National Service which was supported by Gerald Ellison, the Bishop of Chester who had recently blessed a nuclear submarine. I was ordained in 1960, married Julia in 1963 and we have three sons and four grandsons. We served in Warrington, Matlock, Sheffield, Zimbabwe, Leicester and London, mostly in urban priority and multicultural parishes. We now live in retirement in Oxford, and I am also involved in the Oxpeace Network – Donald Reece.